Wukari is a Local Government Area in Taraba State, Nigeria. Its headquarters are in the town of Wukari on the A4 highway. The Donga River flows through the area and the Benue River forms a boundary with Nasarawa State to the northwest. The town is the base of the Wukari Federation, a traditional state. It is the home of the great jukun people. It has an area of 4,308 km² and a population of 241,546 at the 2006 census. The postal code of the area is 670. Kwararafa University is located there. ^ "Post Offices- with map of LGA". NIPOST. Retrieved 2009-10-20. ^ "Private Universities". National Universities Commission. Retrieved 30 December 2018. 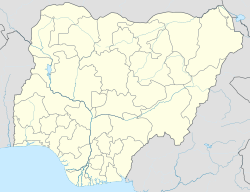 This Taraba State, Nigeria location article is a stub. You can help Wikipedia by expanding it.